Would You Like To Discover the Miracle of the Qur’an Without Leaving Home? Do you read the Qur’an in Arabic without understanding what you’re reading? Have you tried to study Arabic, but never got past the basics because the class was canceled or the lessons became overwhelming and confusing? Do you have Arabic books and software programs gathering dust on your shelf after you gave up on them because they were too time consuming or difficult? Have you ever considered studying abroad but your responsibilities at home make this impossible? Do you wish you could also be moved to tears during taraweeh, like the imam leading the salaah? If you said ‘Yes” to any of these questions, you’re in the right place. Our two-year, part-time, online course was designed for students just like you. No, Arabic is not too hard for you. Thousands upon thousands of Muslims from every corner of the globe throughout our history and today have learned the language and, just like hundreds of your classmates in this 2-year online course, you can too. Really. And when I say “learn Arabic”, I’m not talking about memorizing a list of Arabic words and phrases. I’m talking about learning the intricacies of the language, the grammar and morphology. So that you not only understand the meaning of the Qur’an as you hear it and read it, but you can also appreciate its linguistic miracle — the astonishingly beautiful use of the language that dumbfounded the pre-Islamic Arab. This is what the two-year online foundations program is about. And yes, it is possible for you to learn Arabic to this advanced level. Whether you’ve never studied Arabic before or you’ve tried a dozen times without success, when you have the right approach, you will be able to learn successfully now. You see, the reason that you haven’t been able to learn Arabic yet is not because the language is too difficult. Nor is it because there’s anything wrong with you. The problem is in the way Arabic is taught these days. Instead of learning the big picture first and getting a sense of how the language works, almost all modern programs will teach words and rules little by little with no connection between them – leaving you feeling overwhelmed and making the language seem confusing and random, when in fact it’s quite the opposite. The traditional approach begins by giving you the big picture first, and then proceeds to fill in the details. It’s the exact opposite of the simple to complex approach that you see everywhere today. The traditional approach works because it recognizes the fundamental nature of the Arabic language. Arabic is not a random assortment of letters and words and grammatical rules. It is a beautifully structured system for the conveyance of meaning. And it is a feat of staggering genius of the medieval grammarians that they were able to isolate from this system, a core and a central theme. When you learn this core and central theme first, you will know how the language works. Then each time a new rule or pattern is introduced, it’s not going to be just a random piece of information that needs to be memorized. It’s now a key piece of the big picture that you eagerly grasp and put into place to make your understanding of the language clearer and clearer. After over a decade of teaching Arabic this way, I’ve found that it takes about 8 hours of instruction, spread over 2 ½ weeks to teach this big picture. That means that you’ll be able to start reading and understanding an Arabic book within the first three weeks of class (with my help, of course). I know that’s probably hard for you to believe — especially if you’ve studied for years and have very little comprehension and fluency to show for it. Now, I’m not saying that we’ll be covering the entire topic of grammar and morphology in 2 ½ weeks of part time study. That’s simply impossible (and probably wouldn’t be much fun to try either). What we’ll do, is cover the core and central theme, and the bare minimum of rules and patterns that you’ll need to know to start guided reading. You see, one of your most important assets throughout this course is your motivation for learning. We need to keep your motivation high. So I don’t want you to have to learn a ton of grammar and have to wait for the pay-off. That would not only be boring, but it’ll also be inefficient because it’s hard to remember grammar rules if you don’t have a context to see them in. Your enthusiasm levels will go through the roof, as you see the rules that you’ve learned come alive in the pages of this story book that you are reading directly in Arabic. As we encounter more complex structures and sentences in the book, you’ll have a perfect opportunity to learn them organically. And I’ll have the opportunity to teach it in context. So they’re not disconnected pieces of information. But clearly applicable pieces of a larger puzzle. What exactly is covered in the two years? So this is how our first semester works. We spend the first three weeks of class learning the most important parts of grammar and morphology that give us the big picture understanding of the language. Then, we start our first reading text, Qasas An-Nabiyeen (“Stories of the Prophets”) by Shaykh Abul Hasan Ali An-Nadawi (may Allah have mercy upon him). We complete the first volume of this book in 12 ½ weeks and then the second volume in 4 weeks. As you can see, because we take our time to solidify our understanding of grammar and morphology in the first volume, we become more fluent and progress much more quickly through the second volume. Amazingly, you’re going to see that the author of the Qasas An-Nabiyeen gradually introduces new structures and sentence constructions in the same order and with the same timing that I want you to learn them in. SubhanAllah although we’ve never met, it is as if the author and I have collaborated together to teach you Arabic grammar in this course. Besides that, these books also contain stories, vocabulary and verses from the Qur’an. So as you read this familiar story, you’ll be naturally adding to the vocabulary you need to understand more and more of the Qur’an every week – without any need for long vocabulary lists, tedious exercises or flash cards. In the second semester, we take everything we’ve learned in grammar and morphology and put it into practice as we start reading our first unvoweled text (i.e. without tashkeel, harakaat or zabr, zer and pesh). Now, for a beginner, reading an unvoweled text seems like an unimaginably impossible feat. Without vowels, how do you know how to pronounce a word? And how do you know if what you’re looking at is a verb or a noun? Or which verb or which noun it is? You’ll probably have to just trust me as I tell you this now, but with the grammar and morphology we learn and the practice we’ll get reading, you’ll be able to figure it out. It’s like any skill – like typing or ice skating. If you don’t know how to do it, it looks impossible (even when you see other people do it effortlessly). But once you learn, you almost don’t remember what you thought was so difficult to begin with. Also, like any skill, it does take work and effort on your part to get good at it. However, like the students who came before you, you’re going to find that every hour you invest in refining this skill will reward you many times over with increased proficiency, fluency and understanding. We’re going to work together on this. Each week, I’ll tell you which pages you’ll need to cover before next class. Then, using the lessons I’ve recorded for you, you’re going to try as best as you can to read and understand these pages on your own. At the class, you can then read and translate the unvoweled text in front of me and I’ll correct your mistakes to make sure you’re going in the right direction. Our text is Hidayah an-Nahw, the best book in the world for grammar. It’s a classic. It’s an incredibly thorough, yet concise text that teaches grammar in a style characteristic of many classical texts. Even though I’ve taught it 22 times, each time I teach it, I learn something new. It’s a challenging book, I’ll tell you this now. However, once you study this book, it will relieve you from studying a dozen other books in the science. That’s the power of the classics. Beyond that, you’ll be training yourself to think at the level of the scholars. When you can do that, you’ll be able to read and understand classic books and manuscripts – many of which have yet to be translated from Arabic. After the first year, you’ll have all the tools you need to read and understand Arabic on your own. I encourage you to go out and just use these tools to read whatever book you like. If you’d like to keep studying and honing, improving and refining your skills, though, that’s what the second year is for. This is where you’ll increase your Arabic proficiency as you delve deeper into the sciences to appreciate and be impacted by the linguistic miracle of the Qur’an. We have 4 courses in the second year: Tafsir, Mantiq, Balagha and Advanced Grammar. Here we will be going through the verses of the Qur’an and learning about rhetorical devices and language patterns. It will probably remind you of how we used the passages of the Qasas An-Nabiyeen book as a context to learn about grammatical structures. Now you’ll start learning about Arabic Rhetoric (balaagha), not through a text book, but by seeing this special use of the language used within the Qur’an. We will cover two large surahs from the Qur’an with a very thorough grammatical and rhetorical analysis. The themes, language patterns and rhetorical devices you’ll learn about in these verses will equip you to understand hundreds of other verses like them. So, although the imam might not be reciting from the exact portion we covered in class, you’ll be able to enjoy the recitation because the themes, topics, logical arguments, stories and special use of the language within all portions of the Qur’an resemble each other. Your knowledge of mantiq will ensure that you’re drawing the correct conclusions when you read the works of classical authors. And it will protect you from misleading arguments as you’ll be able to see exactly what false reasoning is being used to reach an incorrect conclusion. Classical Logic is the study of rational deduction and the modes of argument. Besides being a pre-requisite to properly appreciating great works in tafsir, such as Al-Aloosi and Abu As-Saood, studying mantiq will also deepen your appreciation of the Qur’an. Because entire sequences of verses within the Qur’an are formatted based on the rules of Logic. And although logic is mostly intuitive, when you understand exactly why a particular argument leads to its conclusion you will appreciate the argument to a much higher degree. You’ll go beyond satisfaction into absolute certitude. Al-Ghazali was a brilliant author known for his highly elevated prose and his ability explain abstract and complex topics through simple analogies. So as you learn mantiq, you’re going to be reading some great Arabic literature. The two texts we’ll be studying are al-Qistas al-Mustaqeem (The Just Balance) and Mi’yaar al-ilm (The Criterion of Knowledge). Ibn Malik’s “Thousand Couplets” is the last text that students in the Arab world cover on grammar. You will be reading from a rare edition of Ibn Aqeel’s commentary that has neither vowels nor punctuation. This gives you the perfect environment to really develop your skills in deciphering the text and inferring the vowels. Because this commentary is quite easy to understand, you’ll be able to focus your efforts on getting more proficient at reading quickly. Our aim is to gradually wean you off of conscious deciphering – and take you to the point where the deciphering becomes subconscious. So you can read and understand Arabic as quickly and easily as you do English. Rhetoric is the most exalted and noble area of study concerning the Arabic language. It is the science of eloquence – of using the most appropriate language for each given situation and audience. It is said that it is through the principles of Rhetoric (balaagha) that “the veils are removed from the faces of miraculousness within the verses of the Qur’an”. One of the most challenging (and rewarding) books ever written on this topic is Imam Taftazani’s commentary on al-Qazweeni’s Talkhees Al Miftah. After almost two years of steady progress in your Arabic studies, you’ll be ready to start reading this book with me. The study of balaagha will open up a whole new world for you, exposing you to the most wondrous things. We’ve saved this text for the final months of Year 2 so that you’ll have something exciting to look forward to. There are two primary components to this online program. The first is the learning resources. These are video and audio lessons, slides, tables, book scans and transcripts that cover all the topics and books that comprise our program. You’ll see them neatly organized in our online video portal so you can easily find the lesson you’re on, review what you’ve covered, and look ahead to what you’ll be learning next. They’re also downloadable and printable, so you can take your studies with you on your commute, around the house or wherever you need to go. You won’t have to sit in front of a computer to learn. The transcripts are particularly useful to review or catch anything you might have missed. It’s all written out for you. The Self-Paced version of the program gives you lifetime access to all these resources. This means that you can spend as little or as much time on it as you like. You can go through the program quickly or go through it slowly. Study every day or once a week or whenever you have a spare moment. If life gets busy (as it probably will at some point…) you can put your studies aside and come back to them later. Your access will never expire. These resources will always be there for you. Also, just because you don’t have live classes, it doesn’t mean you’re on your own. If you ever have questions about the lessons, you can ask them in the comments section under each video or send us an email. My team and I love answering questions about Arabic. It’s one of the highlights of our day. Really. The second component of the program is live classes, online. When I say live, I mean that you, your classmates and I will all be in the online classroom at the same time. We’ll be communicating in real time. You’ll be able to type your questions so I can answer them. You can take the mic and say something and I can hear you and you will be able to hear me. Live. And because the class is online, you can join us from wherever you are in the world. In the first semester, the live classes are where you’ll practice your verb tables in front of me and where we’ll review the passages of Qasas An-Nabiyeen each week so that you can ask your questions live and I can check that you’re understanding things correctly. In the second semester and beyond, these live classes give you a chance to practice your reading of unvoweled text. Again, this is where we close that feedback loop, so that I know how much you’ve understood and I can fill in any gaps in your understanding and give you course corrections as needed. Live classes are twice a week, one hour each class. One sessions is on Sunday mornings at 8:15 AM Eastern and the other is on Wednesday evenings at either 5:00 PM or 9:00 PM Eastern. (Offered twice to cater to different time zones). They’ll also be recorded, so that if you miss class, you can listen to the recording and catch up and join the next class. If this letter has caused your dedication to grow even deeper, and if you see how you can really get more of the messages Allah has intended for you by truly understanding His language, then please read this section carefully. This program is specifically for people who want to understand Arabic as it relates to our spiritual teachings. And with that in mind, it is completely different from any other “learn Arabic” type of program you might have seen. 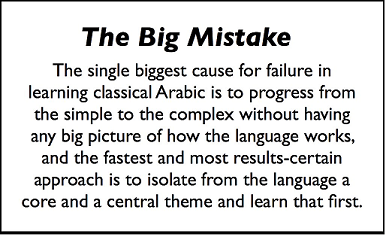 In fact, it’s the only Arabic program that precisely leverages the 80/20 principle the way I explained it to you in the report you downloaded a few days ago (assuming you’re subscribed to our mailing list) so that you can start reading an actual Arabic book by as soon as the third week of class. The complete online program can help you too if you implement it and believe that it’s something that can help you in your studies. In a few days from now, I’ll open up registration to the main program to fill the last few remaining seats. So if you’re really excited about this, one thing you can do is you can fill the form below to join the early bird list. This way you’ll have a chance to join the program before anyone else and you’re pretty much guaranteed a spot. If you’re not at that point, then that’s perfectly fine. Just watch the free videos I’m sending you as a subscriber to our mailing list. You’ll get great value from them regardless of whether you choose to invest in the main program or not. These concepts will help you. So either way, you’ll be getting some great education, insha Allah. Only A Few Seats Remain. Enter Your Name And Email Address Below To Guarantee Your Seat In The Class. Registration will re-open in a few days – You’ll receive priority notification which if used will guarantee for you a spot. Enter your first name and email below and you’re all set! May Allah facilitate your path to knowledge and grant you success in this life and the hereafter. Have you heard what other students are saying? “I am a father of 9, so time is a luxury that I don’t always have. I have tried for several years to learn the Arabic language and this course has allowed me to achieve more in the past 15 months then I have in all my previous years collectively“. “Within first few weeks I realized the structure of this course meant that it was adding to everything I had been exposed to and forming a much clearer map of the language. The course has never felt boring despite my previous exposure and the students are always being stretched and steadily taken to the next level”. “I heard about Shariah Program a few years ago and because I was doing another Arabic course, I did not start with Sharia Program. I am really glad and all praise is due to Allah that I did not put it off any longer, because what I have realized, since joining is that Sharia Program taught in 13 weeks what took 3 years+ in the other course”. “I have been studying Arabic for a decade but seen nothing like it. There is no replacement for this in our English world. All the books written on teaching Arabic fall below par to the standard set by Shaykh Mufti Yusuf Mullan”. “Last week, I heard a Khutbah after Fajr in which I understood almost everything I have heard. It was such an ecstatic moment for me in my Arabic learning…. to tell you all the truth, I was probably one of the worst students in the first 6 months… I resolved to myself that I would not only catch up but also try to be one of the best students in my class…. my family, friends and colleagues say that I am a person who is hard-to-please. Here in TSP, my experience has just been the opposite. I am pleased with the course from Day 1 till now”. “Shariah program has far exceeded my expectations. It is not as expensive as many other programs, yet the benefit from the course is unbelievable. It only requires around 7 hours a week, which is definitely reasonable. Alhamdulillah, each time I hear the Qur’an I’m able to understand more and more with every passing week. I’m only 5 months into the program but have already paid for the entire 2 years because I am confident in Mufti Yusuf’s talent in teaching Arabic, mashaAllah. “I am moving very slowly but what is invaluable is not only Mufti Yusuf’s expertise but his absolute conviction that it is achievable. That inspires me to continue. Everything is there that I need to accomplish the goal. “This is my third series of Arabic classes. I’ve previously attended an Islamic school for three years, and I also took a year of Arabic classes in college, and I can honestly say that I’ve learned far more here in three months than I did in my four prior years in Arabic instruction. Not only that, but what I have learned I am also able to understand and recall far better than anything I learned from my other attempts at learning the language. “This is truly a remarkable system, Mashallah. I was somewhat skeptical that the course would be as good as I had heard, but it definitely exceeded my expectations. Everything that is taught is taught in an amazingly efficient manner, with each issue being brought up multiple times, with each instance increasing the depth of the discussion at a controlled rate, so that by the time a subject is taught in exhaustive detail, the subject will already have been brought up multiple times. It really just flows”. “alhamdulillah I feel like I’m getting much more than my money’s worth and really your program is the answer to my dua’s of wanting to learn arabic seriously. I used to read the website and the testimonials and think that it was all just hype to get people to sign up, but now I can’t stop gushing about it to other people I know having similar problems as I had with finding the right course. Within the 7-8 weeks of recordings you have summed up what I have learned with 3-4 years of part time studies and more, and I’ve understood the concepts much more clearly than before. So I just wanted to say jazakallah for offering the course as I’m really excited to see what else I learn as I go on inshallah”.